Stochastic lines cross — indicates trend change. Stochastic staying above 80 level — uptrend is running strong. Stochastic exiting 80 level downwards — expect a correction down or beginning of a downtrend. exiting upwards above 20 — expect an upward correction or a beginning of an uptrend. Stochastic is a momentum oscillator, which consists of two lines: %K - fast line, and %D - slow line. Stochastic is plotted on the scale between 1 and 100. There are also so called "trigger levels" that are added to the Stochastic chart at 20 and 80 levels. Those lines suggest when the market is oversold or overbought once Stochastic lines pass over them. 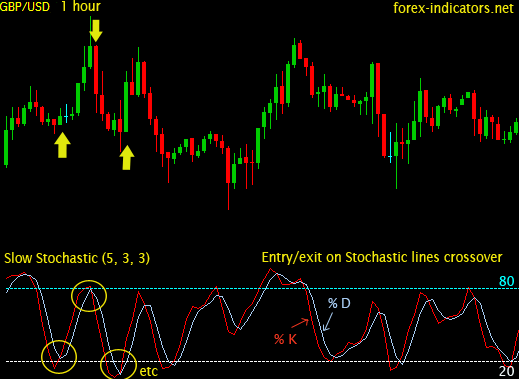 Let’s look at three methods of trading with Stochastic indicator. when %K line from above crosses %D line downwards traders open Sell orders. when %K line from below crosses %D line upwards traders open Buy orders. Stochastic lines crossovers that happen above 80% level and below 20% level are treated as strongest signals, compare to crossovers outside those levels. Stochastic by default has 80% level, above which market is treated as overbought, and 20% level, below which market is considered oversold. It is important to remember that while in sideways moving market a single Stochastic lines crossover that occur above 80% or below 20% will most of the time result in a fast predictable trend change, in trending market could mean just nothing. When price is trending well, Stochastic lines may easily remain in overbought/oversold zone for a long period of time while crossing there multiple times. That’s why a method of trading overbought/oversold zones stands up. The rules here are to wait until Stochastic lines after being in overbought/oversold zone come out from it. E.g. 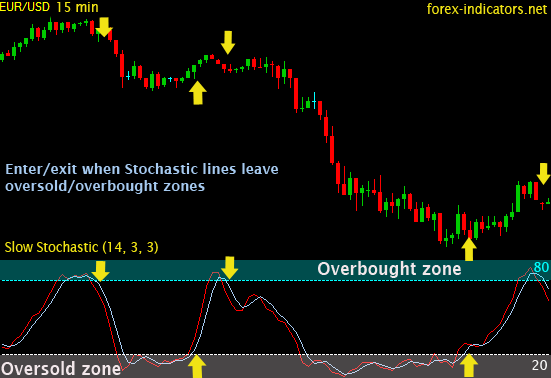 When stochastic was trading for some time in overbought zone – above 80% level, traders wait for the lines to slide down and eventually cross 80% level downwards before considering to take Short positions. Opposite for Long positions: wait till Stochastic lines come into the oversold zone (below 20% level); wait further until Stochastic lines eventually cross 20% level upwards; initiate a buy order once Stochastic lines are firmly set, e.g. a trading bar is closed and Stochastic lines cross over 20% mark is fixed. 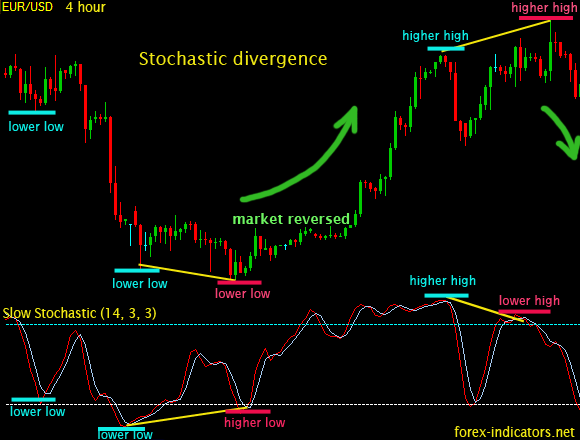 Traders are looking for a divergence between Stochastic and the price itself. At times when the price is making new lows while Stochastic produces higher lows creates dissonance in the picture. It is called divergence. Divergence between price and Stochastic readings suggest a forming weakness of a main trend and therefore its possible correction. the first parameter is used to calculate %K line, while the last parameter represents the number of periods to define %D - signaling line. The difference between Full and other Stochastics lies in the second parameter, which is made to add smoothing qualities for %K line. Applying this smoothing factor allows Full Stochastic be a bit more flexible for chart analysis. very simple but very nicely explained. thank you , it is very clear explanation , I hope you explain RSI indicator ( Relative Strength indicator ) with the same clear charts . You're also right, I should do some work RSI indicator too. Man that was well explained in such few lines, I looked the explanation somewhere else and so far yours is short and well presented. being a novice trader i was a liitle worried that i would'nt be able to get my head around these charts. After reading through this explanation all is clear. Thanks for making it so easy to understand. Great tutorial! Yeah thanks, the explanation is shot but covers all the silient parts. wish you 'll do the same for rsi and some others. Thanks, I really appreciated the tutorial because it is easy to understand as you stated the data with clear explanation and formulas. Awesome! Seems U got much savvy in this aspect. TIPTOP! Couldn't found what to say cuz of excellence, and the method of teaching... never seen before, TIPTOP! I have heard that the experienced players are using double or triple Stochastic inidcators with different parameters and they are enough for them if they have learned to use them correctly. If so, how do they use? Please reply. when using double and triple Stochastics, the main idea is to let the longer period Stochastic to show a trend, while the smaller period Stochastic will give entry/exit signals. Forex traders would pick only those signals, that go with the direction of a trend. 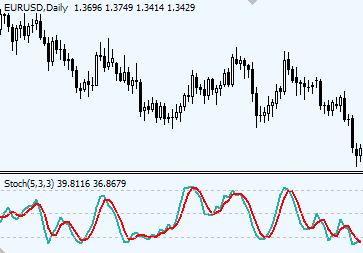 As an example, Forex traders can use 34, 5, 5 and 5, 3, 3 Stochastics together. Great info on the Stocastic Indicator -- thanks! Try focusing on 1 hour and daily charts. Custom indicators would also be worth your attention. Unfortunately, I can't help with the software question. many thanks for Your great help for us!!! I have any question - know You how indicators are using on this video above PLEAS?? This strategy is very attractive, but any MA - which I try - not crossover 80/20%. I'm not sure if I understood your question. Please feel free to ask again. In the video it night be 5, 3, 3 Stochastic - the default settings for Stochastic in MT4 platform. The oversold/overbought zones are set to 20/80 by default, but some traders may also use 30/70. I believe it's 20/80 in the video above. I am not sure which stochastic line is %K and %D? Can I say that the smoother line is %D? But sometimes both lines are so similar. During the setting of Stochastic Slow, can I assume color 1 is always = %K, while color 2 is always = %D? How to display/set the horizontal line of 20 & 80 (can view on the screen).